Although I grew up with two older brothers, there are two ladies in my life that are the closest thing I have to sisters…and those are my cousins. My mom’s sister has two daughters; one who is two years younger than me, and the other, who is only 5 weeks older. I practically stalk the one that is my age, because I call her almost every day…and even though we talk so regularly, it seems like another hour has flown by that we’ve been jabbering away on the phone. You would think that we’d run out of things to talk about, considering we’ve been close our entire lives and talk about so much so often, but that’s never the case. I like that. 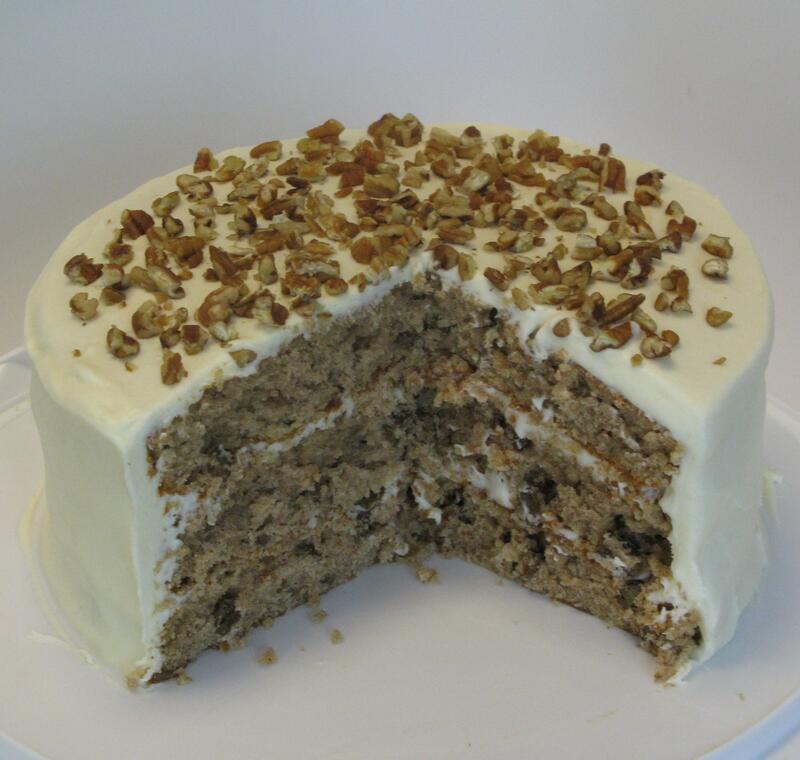 Over the weekend, I was asking her what her sister’s favorite cake was, since it was her birthday, and she said she thought it was a Hummingbird Cake. “A what cake?” I asked, baffled by the name and completely curious as to what all was in it. “Well, it’s fruity…it has pineapple and some other fruit, maybe some orange juice, but I haven’t made one, so I’m not sure,” she told me. Almost immediately after hanging up the phone, I ran upstairs to get on the computer and see what recipes I could find on it. I had it in my head that this cake had pineapple and orange juice in it, and personally that combination is absolutely delicious to me, so the excitement of trying out this cake was all up in my brain. Again, here I was, looking at several different recipes. Personally, chunks of fruit in a cake isn’t very appealing, but the flavor is out of this world…so I decided to puree the fresh fruits and throw in some orange juice in there, because once she mentioned it, that’s what was stuck in my head. It HAD to have orange juice in it, even if it was just a little bit. She has given me many ideas over the past two years of having this blog when it comes to desserts, meals, saving money tips and cleaning advice. She’s my hero. With this cake, if you don’t feel like cutting up a pineapple or would just prefer to used canned pineapple, that will work just fine…but I’ve heard my cousin and my husband rant and rave about how amazing fresh pineapple is, so that’s why I decided to use that with this recipe. As I was cutting it up, a couple of pieces ended up in my mouth. My daughter was standing up on a chair watching me at the counter, I looked at her and said, “Mmmm, yummy in the tummy!” She smiled and repeated it. Although she eats pineapple all the time in her fruit cups, she made a face when I tried to feed her a piece of fresh fruit. Maybe it was making a face at her or something, there’s no telling with a 2 year old. The great thing about having leftover pineapple is that I’ll be using it to make a fruit smoothie with orange juice in the morning when I get up. Yummy in my tummy. Again. Preheat oven to 350 degrees. In a blender or food processor, combine; pineapple, bananas, orange juice, vanilla, eggs, and oil. Blend until smooth. In a large bowl, add all dry ingredients and stir together with whisk. Pour in puree, beat with electric mixer on low/medium speed until combined and smooth. Stir in pecans. Grease and flour 3 9-inch cake pans, and pour batter evenly between the pans. Bake for approximately 35-40 minutes, or until toothpick inserted in center comes out clean. Cool in pans on cooling rack for 20 minutes, then turn out on cooling racks to cool completely. Ice with cream cheese icing, store in refrigerator. Combine butter, cream cheese, and vanilla in large bowl, beat at medium speed with electric mixer until smooth, about 2-4 minutes. Add powdered sugar, continue mixing for another 3-4 minutes, until smooth.